It is up to ALL of us. 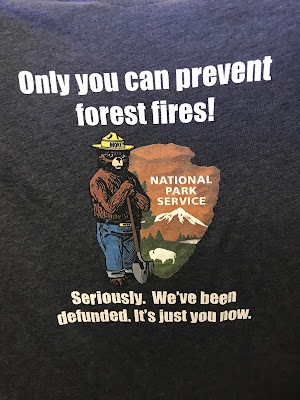 The NPS is something we should value. It's funding and the people who who visit the parks can actually help prevent forest fires. Seriously it all starts with listening to firework laws, not littering with cigarette buds. Making sure your campfire is out before you go to sleep. Its sad that most forest fires ARE caused by humans. You may of noticed the name on the hat isn't Smokey. Smokey Bear nor any Federal Government insignia are copyrighted. So sad that they have lost funding. I hope that people get involved and donate.